(L-R) Joy Behar, Mary J. Blige, Maxwell; ABCThe View‘s 20th season is in full swing, and Mary J. Blige appeared on Friday’s episode to talk about recording the ABC show’s first original theme song, “World’s Gone Crazy,” written by celebrated songwriter Diane Warren. Warren appeared via satellite during the segment to congratulate The View for twenty years on the air. 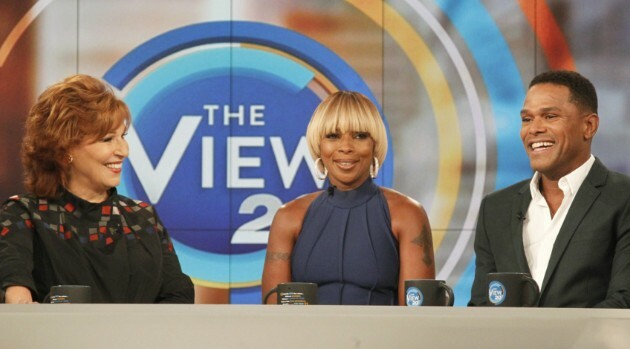 “A huge congrats to The View on its 20-year anniversary. I am proud to have written ‘World’s Gone Crazy,’ the first theme song The View has ever had. That is pretty cool. I have to say that’s pretty cool,” said Warren. “Knowing the song would be shared with your audience every day is so exciting for me. A shout out to you Mary, who made the song come alive. Like you always do,” added Warren. Mary J. also told fans when they can expect her new album. “It’s coming either December…around December. Before January, though. We’re trying to play it by ear. But it’s coming soon though. You’ll be hearing some music soon too,” she said. Also, the audience was treated to a surprise guest appearance from Maxwell, who is embarking on a joint concert tour with Mary starting November. Blige assured that both herself and especially Maxwell will deliver their usual best performances onstage during the event.